Here’s the list! Click on the links to learn more about each project and see our results! Painting with magnets. This is such a fun way to mix science and art! Decorate the windows. This is one of our absolute favorites and is such a great way to experience stormy weather. Gets kids standing and climbing in the window. Create a stained glass effect using cellophane, soap and water, or use washable paints and let your kids go to town. Paint on a chalkboard with water. Stand up and move those arms. If they get a little crazy, that’s okay, it’s just water! Shaken container painting. This one can get really active. Kids can really burn off some energy! Shake and jump, or dance and swing! A word of caution: fit the lid tightly!! Spinner art. Use the kids’ favorite kitchen tool – the salad spinner to make art that looks like fireworks. Marble painting. What child doesn’t like a little ball play? Kids love the challenge of manipulating objects to create wild art. Color smooshing. Try this fun technique that is especially great for toddlers and preschoolers. All the mess is contained and kids learn color theory at the same time! Marbled paper with shaving cream. This one is not as full-body active as some of the other active art projects on this list, but it involves squirting and swirling, which is always a big hit. It also has a big WOW factor! Easy art on big paper. If you cover your floor with butcher paper, you can get the kids moving in all different directions. Be sure to promote creativity by providing printing materials for hands and feet! See how we did it! Create life sized body art. Kids get out of chairs, lie down and move around on the floor, and use big arm movements. You may not realize it but big arm movement is crucial to the development of fine motor muscles. See, art and physical exertion are not incompatible. In fact, getting active is a fun change from sitting down with a coloring book! These art projects are all about the process, so let your children explore! 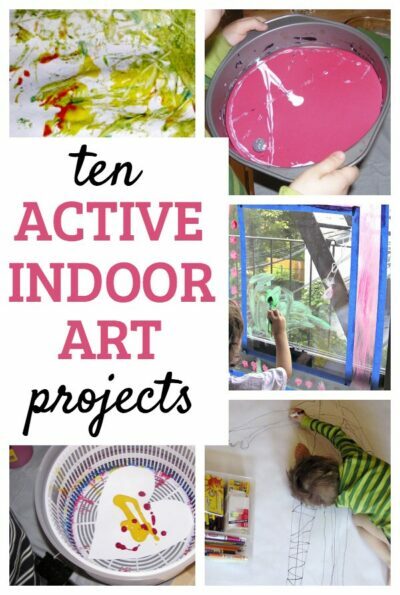 For more indoor play ideas, including art projects, see our giant list of indoor activities for kids. These are perfect for those long winter days! Thanks for the ideas! SO many fun ideas! My kids are currently obsessed with a big white board we took off an office wall and put down at floor level instead. They’ve been putting dry-erase markers between their toes to try to draw and write with their feet, marveling at how cool it is to make pictures by ERASING color, and drawing roads, paths, ponds and more for their toy cars, horses and characters to explore. These sound fun. Our weather just turned, so we will give some of these a try. Thanks Christy. I’m not looking forward to the colder weather, so it’s nice to have some ideas at the ready.